Now is the time you definitely can’t have too many soup recipes! It’s been soup half the time around here for the last few weeks and I’m sure that’s not about to change, I’ll probably only start making it more often to get through this bitter cold season. Ahhhh to sink my toes into the warm sand on a tropical island somewhere is sounding really nice just about now! 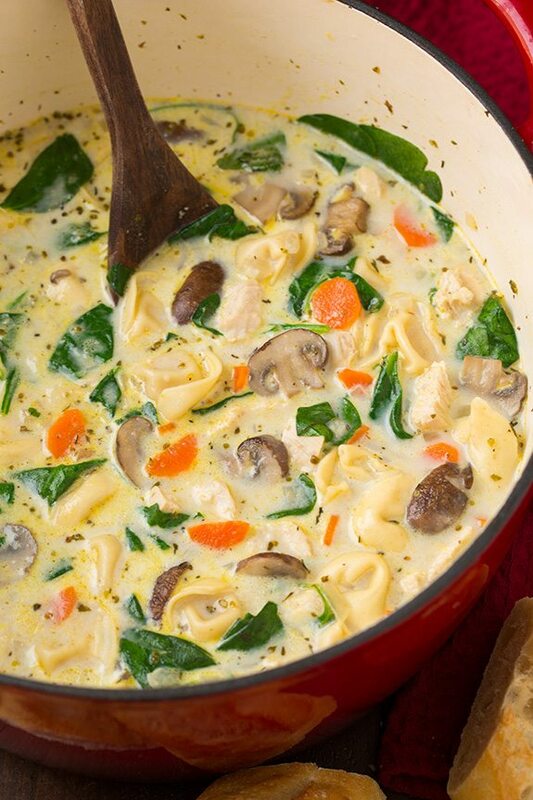 But until then I’ll sit back and dream and sip on a warm bowl of this delicious Creamy Chicken, Spinach and Mushroom Tortellini Soup (and I know isn’t that a ridiculously long name that seems so unnecessary? Well each word is must because you need to know how much goodness is packed into this soup). This is a deliciously creamy and hearty soup and it’s total comfort food for this season! 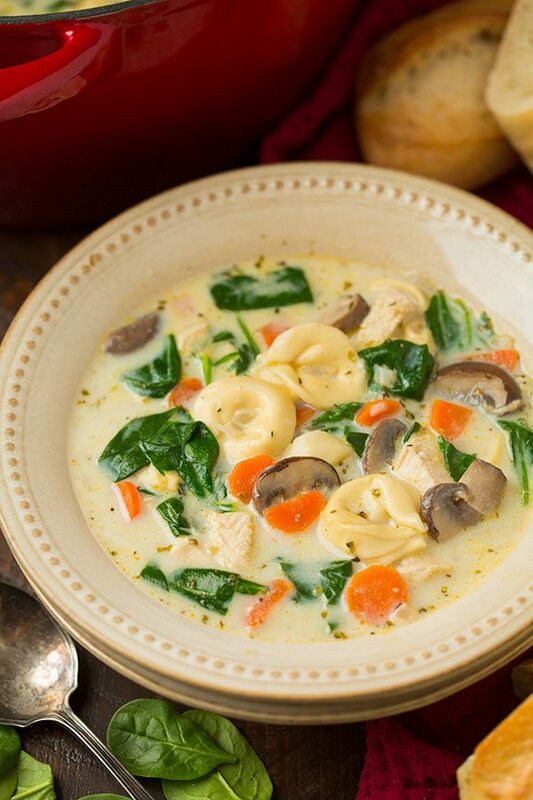 The chicken, spinach, mushrooms and tortellini all just go so well together and they are perfectly complimented by the creamy broth. 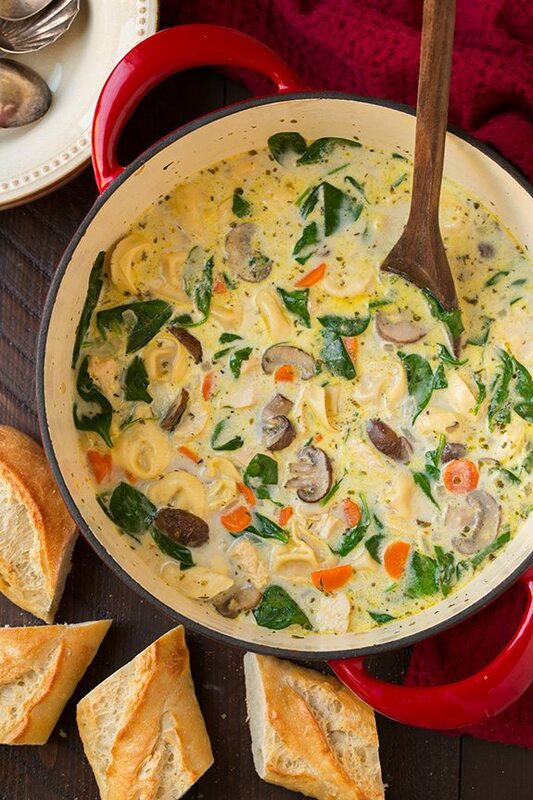 Try it, you’ll love everything about this soup…unless you are like my husband and hate mushrooms then you just may find yourself picking them out. I don’t get the mushroom hate – they’re just so good! But if you hate them you can definitely omit them. Tortellini soups are some of my favorite kinds of soup, tortellini has got to be the best kind of pasta, right? I’m mean anything with a hidden pocket of cheese inside has got to be good! Enjoy and stay warm! Heat olive oil in a large pot over medium-high heat. Add onion, carrots and mushrooms and saute 3 minutes then add garlic and saute 1 minute longer. Add in chicken broth, chicken, oregano and thyme and season with salt and pepper. Bring to a boil, then reduce heat to medium-low, cover pot with lid and allow to simmer 10 - 15 minutes until chicken is cooked through (it should register 165 degrees in center on an instant read thermometor). Remove cooked chicken from soup and transfer to a cutting board, let rest 5 minutes then cut into pieces. Meanwhile, add tortellini to soup in pot, cover pot with lid and allow to boil over medium heat about 7 minutes (or time directed on package) adding in spinach during last 1 minute. Stir in chicken, white sauce and cream. Serve warm with parmesan cheese. 0 Response to "Creamy Chicken, Spinach and Mushroom Tortellini Soup"